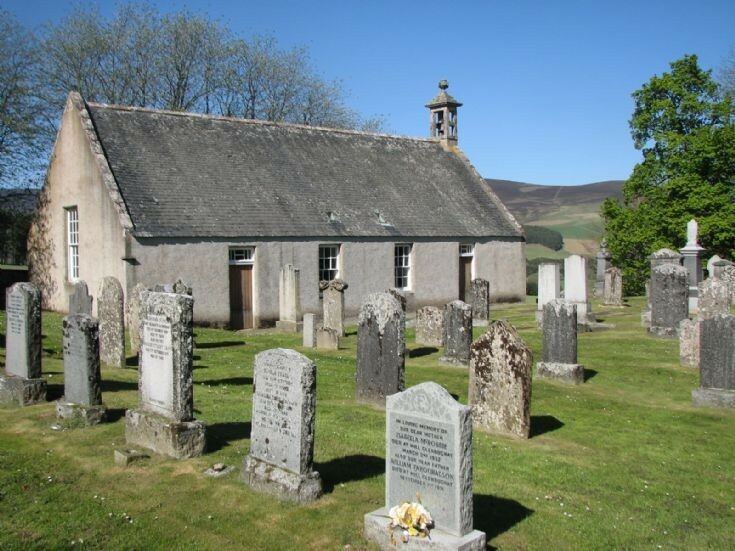 Starting in autumn 2014 a project is underway to record the details of the gravestones in the Glenbuchat Kirkyard. The project will be carried out gradually over the next few months. 3. To record the texts on all the graves. 4. To link the people recorded in the stones with the family histories contained in the Glenbuchat Heritage Web site. At the time of writing, the fallen gravestones have been lifted and restored and now look as good as new. The Forsyth grave/monument which was in many bits is being restored. The graves have been photographed and it is hoped to clear and identify the worn flat stones. 2015 Plan of the gravestones with text itemising the graves and eventually linking them all up with a photograph. Finally there will be many pages of photographs to which it is hoped to add text from the stones and family linkage to other web site pages. The grave photographs are in some cases indistinct partly due to wear and tear but also due to the angle of stones to the light. In some cases techniques have been used to enhance the view of the writing which may not reflect the true colour of the stones. You have outdone yourselves,great photos,and info on stones,can't thank you enough. I feel like I have been there just through you pictures. I check you site everyday. Sincerely,Diana Guidi. P.s Thank Peter agin for the photos he took of my family the Dawsons,and the Rannie. Have not visited for a while but came across this effort today -I am in total awe of what has been accomplished- THANK YOU so much to all involved. I visit from Canada every 2 years and visit the Kirk on every trip. My family connections are Beattie, Brodie, Gauld, Henderson, McRobbie, Murdoch, Ogg & Reid. Again it's beautiful work & thank you.